A teacup Chihuahua is less than a handful. Whether you call them “teacup Chihuahuas” or “pocket Chihuahuas,” these little guys are tiny. When they’re puppies they actually will fit into your teacup. Although these terms are not official breed designations, they’re descriptive enough to let you know you’re talking about the smallest members of a tiny breed. The only thing that makes a teacup Chihuahua different from any other Chihuahua is its size. Even a “big” Chihuahua shouldn’t weigh over 6 pounds. But there’s no minimum weight that applies, and teacups usually weigh in at 3 pounds or less. While you can argue all day about whether size matters or not, many folks find tiny dogs like to be definitely desirable. Be aware that a tiny puppy may still grow into a full-sized adult, so if your heart is set on small, look at the parents, too. Small parents make it more likely that the pup will stay small as well. 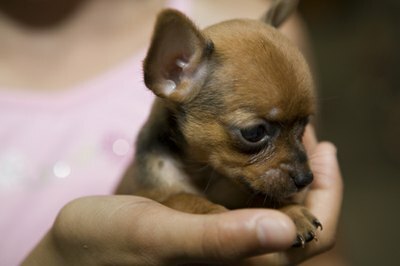 Choosing a teacup Chihuahua means you need to be ready to provide some extra care, especially when the dog is young. Due to their extremely small size, these puppies are highly susceptible to hypoglycemia. They can succumb to low blood sugar within a few hours, and some breeders won’t sell a puppy to anyone who can’t be home with it around the clock for the first few months. Even adult teacups are susceptible to these problems and may require special care if they miss a meal. A quick dose of corn syrup can usually help set things right, but it’s best to call the vet, too. While many breeders insist on calling their Chihuahuas teacups, the Chihuahua Club of America states that size variations are normal within the breed, and there is no such thing as a teacup Chihuahua. Some breeders use the name because it sounds better than calling tiny puppies runts or undersized, and it even lets them charge more for the little ones. That doesn’t mean that there’s anything wrong with the small fry; they can be as healthy as the bigger ones, but they’re also not some special breed or variation, they’re just small Chihuahuas. Even the tiniest of Chihuahuas will still have the typical temperament of the breed, a disposition that is often compared to that of the average terrier. Chihuahuas tend to be a bit feisty, with a self-confident attitude, and are normally alert and energetic. They want to be the boss of all that they see, including you, your significant other, and any other pets that you may have. Despite their bossiness and need to be in charge, they are loving, loyal companions that want to be near their owners at all times. Big or small, Chihuahuas form a strong bond with their people and are almost always deeply attached. Most folks who have these little guys in their lives will tell you that the feeling is mutual.